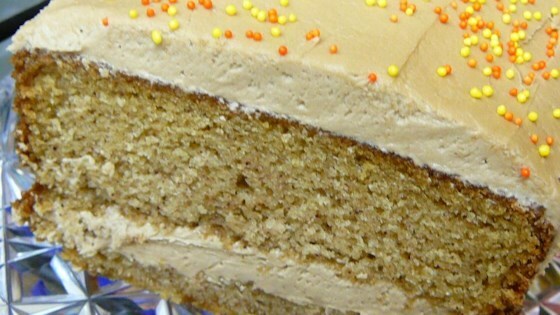 "I knew that my husband's favorite cake was spice cake so I made this for him and he absolutely died when he tasted it! It's now his favorite (even better than his mom's recipe!)." Preheat oven to 350 degrees F (175 degrees C). Grease and flour two 9-inch cake pans or one oblong pan. Sift flour, white sugar, baking soda, cinnamon, nutmeg, cloves, and salt together. Add brown sugar, 2/3 cup shortening, and buttermilk. Beat 2 minutes. Add eggs, one at a time, beating well after each addition. Bake at 350 degrees F (175 degrees C) for 30 to 35 minutes or oblong pan for 45 minutes, until toothpick comes out clean. Cool. Frost. To make frosting: cream butter and 1/2 cup shortening together. Add maple flavoring. Gradually add confectioners' sugar. Gradually add milk and continue beating until light and airy. Add more milk if necessary. Color with maple coloring, if desired.